Another recipe from the Holiday cooking guide, my mom's recipe for Turkey Dressing has been one of my all-time favorites. I suppose you could stuff the bird with this, but I don't like squishy stuffing, so we always make it in a separate pan. It gets nice and toasty this way. 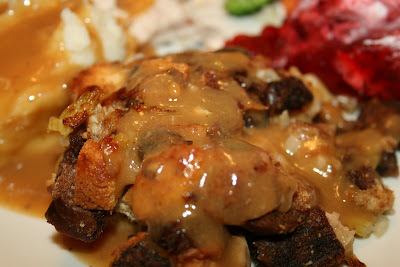 I just have to say here that I don't like it when people get all fancy with their dressing/stuffing. Cornbread. Rice. Sausage. Mushrooms. YUCK. Just give me some good turkey giblet dressing. Especially if I can drench it with turkey gravy. And now I have to admit one more thing. I don't always use ALL the giblets. I have a dog, and she appreciates a little holiday dinner too so I normally use just the neck meat in the dressing, then give Sitka the chopped up heart and gizzards. (I also boil the liver separately so she can have turkey liver sauce for another meal. No, she is not a spoiled dog. Really!) But if you are in love with using the heart and gizzards in your dressing, go for it. A note on the bread cubes. We buy good bread and then cut it and dry it ourselves instead of buying crap in a box. I like a blend of good dark rye, wheat, and a hearty white bread. I bought some Oroweat dark drye bread this year. Cube about 4-5 slices of each flavor, toss into a baking dish and let dry out in the oven overnight at about 175 or 200 F.
1. If you haven't already, remove the meat from the turkey neck. Chop or shred it and place in a mixing bowl. 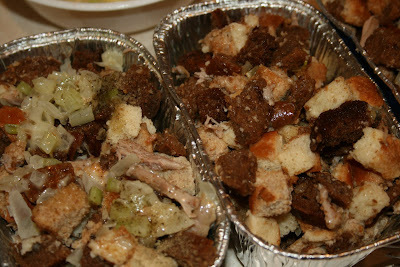 Add bread cubes to the bowl. 2. 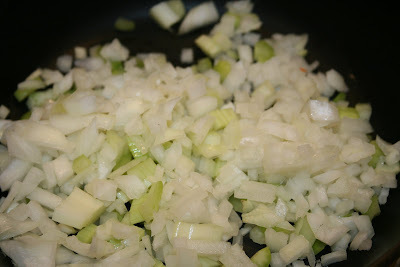 In a small frying pan, sautee the onion and celery in the butter and olive oil until softened and the onions are translucent. 3. 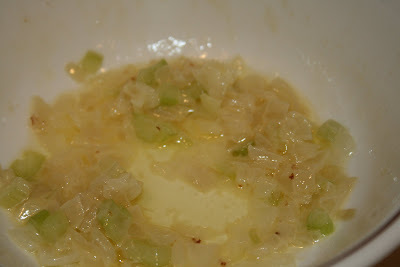 Add the onion-celery mixture to the mixing bowl. Add turkey stock and seasonings. Toss to combine. 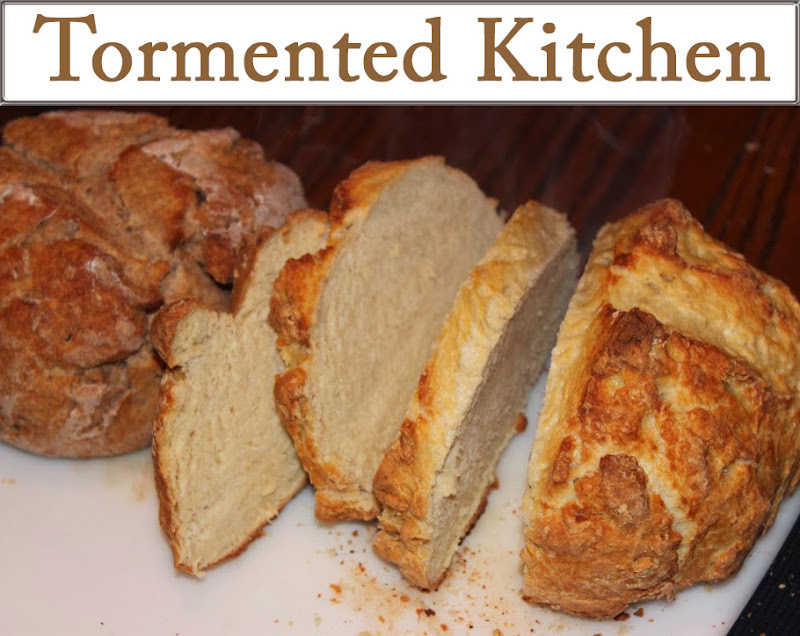 You want to moisten the bread cubes without breaking them up. If dry, add a little more stock. 4. 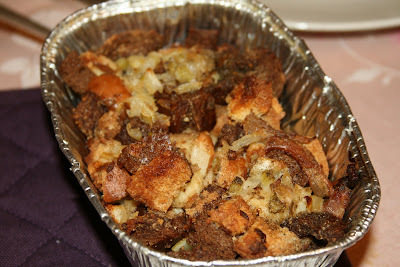 Place in a greased 9" x 13" pan, or 6 mini loaf pans as shown here, and bake in oven. Grandma's oven was too small for everything so we had to use the mini loaf pans so they would fit around the turkey. Temperature should be whatever the turkey is cooking at (325 or 350, depending on your turkey instructions). Bake 45 minutes to an hour, or until toasty.